This is the biggest question on a homeowner’s mind before calling a pool removal contractor to demolish their pool. After all, a well maintained pool is a pride to homeowners who like to showcase it during parties. While a pool adds to the beauty of a home, it could be expensive to maintain it, which is why many families look at demolishing their pool. Appraisers and Real estate agents have mixed and opposing views on this. Since appraisers add or subtract value of the house based on it’s amenities, loss of a pool is considered a minus and they thereby reduce the value of the house during appraisal. But wait… don’t be concerned yet, since that’s not the whole story. While appraisers may cut down the value of the house, they acknowledge that that’s not always what the market perceives. In some areas, not having a pool has a higher market value than the appraised value. Contact us for more information in your area. When our staff polled real estate agents on this question, the answer usually is “Well, it depends…”. It all depends on the area you live in, the demographics, the size of your lot, etc. If the size of your lot is very small and you don’t have a lawn, but only a pool, then getting rid of the pool would only add value to the house, since would-be home owners always prefer a lawn. Are you in a good elementary school district, are new home owners moving into the are for this school, then the chances are that not having a pool would increase the attractiveness of your home. This is because, most homeowners with children prefer not to have pool, as it’s seen as a liability. If you have a hot tub, spa or jacuzzi that must be removed, call Deconstruction Pro today. We are professionally trained to handle any job. 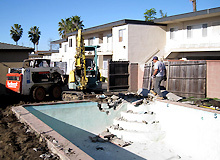 We can remove a hot tub or spa from any home in the Los Angeles & San Fernando Valley area. Removal from back yards or indoor hot tub removal.Feel free to contact us for more info. If the hot tub is located in a tight space and must be dismantled before removal, we can cut it up with our special saws. No matter where your hot tub or spa is located, we can remove it for you. Our team also takes care of the hot tub disposal. We clean up your property after the job is done and leave no trace of rubbish or demolition debris behind. If you need to reclaim your back yard space and want an old spa removed, call us. If you have an indoor hot tub or jacuzzi that must be removed to make way for renovation then look no further. We can claim back your living area by removal of an unwanted indoor hot tub. We work carefully to insure that your home is not damaged in the process.